Provide comfort for the family of Evelyn Westhoff with a meaningful gesture of sympathy. Richland, PA: Evelyn S. Westhoff(nee Sisco), 90 years old, died peacefully at Richland Health Care Center, Richland, PA on Saturday, February 9, 2019. Born to Harold R. and Eva Sisco in Vernon Twp., NJ, she lived in McAfee, NJ till her marriage and then lived in the Deer Trail Lake section of Stockholm, NJ for many years. Evelyn worked as a teacher’s aide for the Hamburg High School for 2 years and then the Hardyston Elementary School for 29 years before retiring. She also worked for 14 years at Plastoid Corp in Hamburg as a Head of Scheduling. 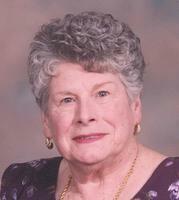 Evelyn was an active member of the McAfee Union Bible Church and the Stockholm United Methodist Church. She enjoyed the studies of Christian and Public Education. Evelyn is predeceased by her husband, John”Jack’Westhoff(2012) and a brother, Harold Sisco, Jr. and is the devoted mother of Rev. Blaik J. Westhoff and his wife, Susan of Newtown, PA. Loving grandmother of Nathan and Rachel Westhoff. Dear sister of Helen Webb of Wantage Twp., NJ. Sister in law of Joan Sisco of Vernon Twp., NJ. Donations are being accepted for: Stockholm United Methodist Church. Blaik and family, Thinking of you and your family in this time of loss. Your mom was a wonderful woman. Matt and I send our hugs. I’m so sorry for your loss. Evelyn will be missed. What has helped me in times like these is Revelation 21:4 which says, “And he will wipe out every tear from their eyes, and death will be no more, neither will mourning nor outcry nor pain be anymore. The former things have passed away.” I hope this will comfort you as it has me. If you need anyone to talk to, feel free to reach out to me.